Alain Johannes is a seasoned collaborator with, amongst others, Josh Homme, appearing on the famed Desert Sessions series of recordings, as well as playing guitar in Queens Of The Stone Age and Them Crooked Vultures. So a great pedigree, and his live contribution to the latter supergroup, when I saw them in Paris, was particularly sharp. He has also made music over several years with his partner and longtime collaborator Natasha Shneider, most regularly in their band Eleven. Tragically, Shneider died in 2008 and this record was released last year in the USA - an honourable mention in our albums of 2010. 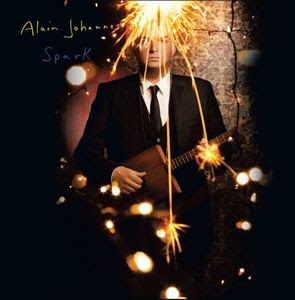 'Spark' is Alain Johannes' tribute to her. It's inspired - he says in fact literally - by her presence and her guidance in the studio, which sounds rather intense, and indeed the album opener 'Endless Eyes' is quite full-on. But thereafter it's an almost joyous experience, and certainly uplifting. Not surprisingly, it is stylistically related to the work of Eleven but it has a decidedly Eastern twang and cadence. The acoustic instrumental lineup gives it a brilliantly clean sound, with really expertly played acoustic guitars mostly taking the lead (notably on 'Make God Jealous'). At the same time, Johannes' voice is expressive and reassuringly familiar to QOTSA followers. The songs are uncomplicated yet effective and my personal highlights would be 'Return To You', 'Speechless' and 'Gentle Ghosts'. Sometimes simplicity can be so accomplished and this is one of those albums - eight songs and around thirty minutes long - where purpose and execution just fit together to create something special. It is exactly what its title suggests - a 'Spark'. 'Spark' is available to purchase at your local retailer, iTunes, Amazon.co.uk etc.